Poet Kate Daniels will read from her work, answer questions, and sign books on April 27 as Poetic Principles takes up its new home at the Library of Virginia. Originally a program co-sponsored by New Virginia Review and the VMFA, which was the host of the events, the reading series will now take place at the Library, which has replaced the VMFA as co-sponsor and as host. New Virginia Review's role is unchanged. The program begins at 6 PM and is free and open to the public. Kate Daniels, a Richmond-born poet and graduate of the University of Virginia, has been awarded the Pushcart Prize, the Crazyhorse Prize for Poetry, and the Louisiana Literature Poetry Prize, as well as the James Dickey Prize. 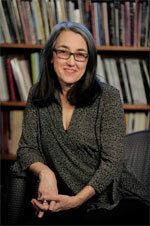 An associate professor of English at Vanderbilt, Daniels was recently named the winner of the 2011 Hanes Award for Poetry by the Fellowship of Southern Writers for her work to date. She is the author of A Walk in Victoria's Secret (2010), Four Testimonies (1998), The Niobe Poems (1988), and The White Wave (1984). There is free parking for this program in the Library’s underground deck, which is accessible from either Eighth or Ninth streets. For many years, Library of Virginia users have enjoyed on-site access to the Historical Washington Post (1877–1994), Heritage Quest, Civil War Era, and American Periodical Series databases. The Library is now pleased to also offer remote access to these resources. From the Library’s Web site, select the appropriate subject category and link under Research Databases and eBooks and enter your Library of Virginia library card number when prompted. Also available via the above link are two new online offerings: the Norfolk Journal and Guide and the Sanborn Maps Geo Edition databases. The Norfolk Journal and Guide (1921–2003) newspaper had a circulation of more than 80,000 by the 1940s and serves as an excellent primary source for researchers. It encouraged blacks to vote, argued against restrictive covenants, and was one of only a few black newspapers to provide on-site coverage of the 1930s Scottsboro trial. Unlike many other black newspapers, it campaigned against the Great Migration of southern laborers to the North. At some point, you have probably passed through the lobby of the Library of Virginia and witnessed a tour group following one of our docents. Patrons listen intently as our docents lead them through the Library's exhibitions, excitedly gesturing with their hands to make a point. Who are these volunteers who help make the history and exhibitions at the Library come to life? And what brought them here? We asked some of these docents to share a little about themselves. Libraries across the commonwealth will be celebrating National Library Week from April 10 through 16. Sponsored by the American Library Association, National Library Week has been an annual celebration since 1958 of the contributions of our nation’s libraries and librarians. All types of libraries—school, public, academic, and special—participate. The theme this year is Create Your Own Story @ Your Library. Virginia’s public libraries are offering a variety of programs from photography contests and lectures to children’s programs and book talks to celebrate. Visit your local library during National Library Week and join the celebration. On November 7, 2011, the Library of Virginia will present The Chesapeake Bay and the War of 1812 to commemorate the bicentennial of the War of 1812 and to explore the importance of the Chesapeake. The exhibition will address Virginia's role in the War of 1812, including the Chesapeake and Leopard affair of 1807 (impressment of American citizens as one cause of the war), the British blockade of the Chesapeake Bay, and the military engagement at Craney Island. Artifacts and digital reproductions present the bay's ecology, the exploration and mapping of the bay by European settlers, and the bounty of the bay. This exhibition runs through September 15, 2012. The Library of Virginia recently acquired the papers of Bayne Palmer O'Brien (b. 1920), of Northumberland County and Richmond, Virginia, containing genealogical research she undertook on behalf of various clients, many of whom were seeking admission to a particular genealogical or patriotic society. The papers cover the years from 1962 until 2001. The files contain correspondence, working notes, and the final reports that O'Brien prepared for clients. There are abstracts and transcriptions of cemetery records, census records, church records, deed books, land and personal property tax records, military and pension records, minute and order books, vital statistics, and will books and other estate administration records. Also included are genealogical and pedigree charts, copies of Bible records, family group sheets, copies from published works, and lists of sources she consulted. Bayne Palmer was born on April 18, 1920, in Lancaster County, Virginia. She was the daughter of Arthur Joseph Palmer and Hester Marie George. She married Herman Randolph O'Brien on April 8, 1955. Bayne Palmer O'Brien attended Strayer Business College in Baltimore, and later worked as an accountant in Richmond, Virginia. She was president of the Virginia Genealogical Society (1976–1978), and a member of the Northumberland County Historical Society, Jamestowne Society, Huguenot Society of Virginia, N.S.D.A.R., and the Northern Neck Historical Society. O'Brien was a certified genealogist and also taught courses in genealogical research. Libraries all over Virginia will hold a “Snapshot Day” between April 17 and 30 to collect information and photographs that illustrate the impact that Virginia libraries make in their communities on a typical day. Snapshot Day is a Virginia Library Association and Library of Virginia project, based on similar projects of the same name that began in New Jersey and have been held all over the country. The goal of Snapshot Day is to encourage Virginia libraries to collect and report basic data on a given day between April 17 and 30, such as how many people visited the library, used computers, or attended programs and to show images of people using the library and its resources. Virginia’s libraries are busier than ever these days, with people coming in to check out books, as well as to use computers, look for jobs, and attend the many programs our libraries offer. All across the state, libraries are the cornerstones of their communities, places were people come together to visit, learn, and share ideas. On April 27 the Library of Virginia will participate in Snapshot Day. There will be a chance for library customers to comment on what the Library of Virginia means to them, and pictures from libraries all over the state will be available on the Snapshot page on Flickr.com. Visit the Library of Virginia on April 27 and be a part of Snapshot Day 2011. All jewelry in the Virginia Shop will be 20 percent off for the month of April—online and in the shop—including Virginia-made jewelry from local artists such as Susan Brookes Design and Historically Inspired Designs. This is high-quality, affordable, hand-crafted jewelry. No coupon necessary. This sale does not apply to state seal merchandise. The Virginia Shop, located on the first floor of the Library of Virginia, is open Monday through Saturday from 10:00 AM to 4:00 PM. For more information call 804-692-3524. On May 9 the Virginia State Historical Records Advisory Board (SHRAB) will sponsor a free workshop at the Library of Virginia for active members, staff, and volunteers of Virginia’s local historical societies. In response to participant feedback from the highly successful Where History Begins workshop held in May 2010, SHRAB secured funding from the National Historical Publications and Records Commission (NHPRC) to host Introduction to Basic Imaging: How to Do a Small Digitization Project. The workshop, presented by the Society of American Archivists (SAA), will teach participants the basics and benefits of digital imaging projects and introduce the process of digitization to historical societies interested in beginning a small digitization project. The workshop will be offered in two half-day sessions and grant funds will allow the first 70 registrants to attend the training free of charge. In addition, a limited number of travel stipends will be available for attendees traveling more than 150 miles to Richmond. To register, call 804-692-3605. For more information, please contact SHRAB deputy state coordinator Carl Childs at 804-692-3739. Virginia’s history and culture have always been of interest to people around the world. Through the Library of Virginia’s acclaimed Virginia Memory Web site, the reach of the Library and its incomparable collections has grown. On February 18, our Virginia Memory: Digital Collections and Virginia Memory: CW 150 Legacy Project sites were featured on the "delicious" page of the Web site for the Vere Harmsworth Library, the University of Oxford’s main research library for U.S. studies and one of the school's Bodleian Libraries. “What are the characteristics of a successful digitally-inclusive community?" More than 70 organizations with deep knowledge about public access technology and the diverse educational and information needs of communities will spend the next few weeks considering that question. These organizations will contribute to Institute of Museum and Library Service's response to the National Broadband Plan, which called on the agency to develop tools for communities to use to assess their needs for public access technology. The plan recognized the essential role of libraries and community-based organizations in expanding broadband adoption and use. IMLS is working in partnership with the University of Washington Information School and the International City/County Management Association to engage a broad range of stakeholders in the development of a framework that will help public and private funders make critical investments in public access technology. These 70 organizations will build on work begun by a 16-member working group that met in Washington, DC, in January to identify the principles, elements, and characteristics of organizations and communities that foster digital inclusion. A subsequent phase of the process, planned for late spring and summer of 2011, will include a combination of a call for public comments and town meetings in order to solicit additional input and to highlight promising practices. For more information, please see http://www.imls.gov/assets/1/AssetManager/DIC-FrameworkReport.pdf.